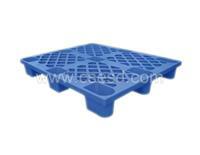 Product Name: No.14 Plastic Pallet Product Information:No.14 Plastic Pallet is fracture-resistant, anti-aging, load-carrying, stretched, anti-compression, slitting-resistant and high temperature resistant. Product Information: Plastic pallet is fracture-resistant, anti-aging, load-carrying, stretched, anti-compression, slitting-resistant and high temperature resistant. It is widely used not only for products turnover, but also for products shipment and freightage stacking, with the features of lightness, durability, dust prevention and excellent appearance. It is suitable for reasonable loading and available for overlapping of multiple pallets, efficient for utilizing the space, it can improve the storage volume of electron components, PCB board and dust-free workshop components, which is to save the cost. It helps to complete the electron components turnover and transporting, generalization of storage and integrated management. It reduce the cost and improve the products’ quality and profit, which is the necessity of modernization production management of manufacturing enterprises and circulation enterprises.